A brand new format £35/£70 duel Jackpot/stake totally random game with some unique game play. Only 3 of a kind wins pay from left to right and "vice versa". 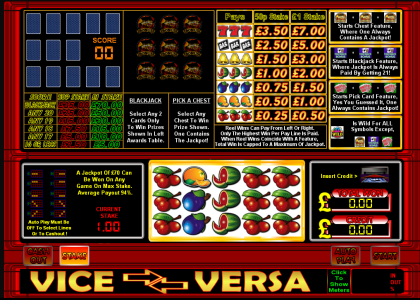 With each feature being totally random and interactive, it is possible to win a jackpot from every single feature, you just have to make the correct choices! This game has a long term expected 90% payback. The volatility of this game is mid to high. This game has our hide meters option and keyboard shortcuts. Once payment has been made please request your game code via email to activate your game fully. Game updates and codes are sent out as soon as possible.